Saving With Selena: Hobby Lobby 40% off coupon + other deals (Labor Day Week)! Hobby Lobby 40% off coupon + other deals (Labor Day Week)! Example only. Click below link for more details. Hobby Lobby released it’s new circular and sales ad today with another 40% off coupon (valid through September 8th)! 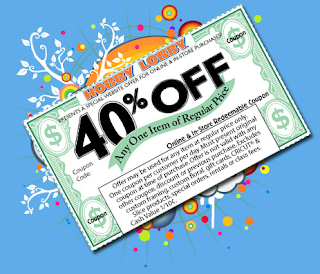 You can use the 40% off coupon on any item that is NOT on sale. Follow the links above for more information! Hobby Lobby is a family friendly company that believes employees should have time with their loved ones. Remember, Hobby Lobby stores are closed on Sundays, so the deals all start tomorrow! Have I told you how much I love you Collin? Yes they may offer this coupon a lot but if you had not posted it I would not have remembered, I always forget about it. Thank you so much for taking your time for us!